After her recent move from Pennsylvania to Maine in Fall of 2018, Lizz is excited to be surrounded by so many artists and like-minded people in this beautiful new state she calls home. She received her BFA in Crafts with a Textiles concentration at Kutztown University, and was the recipient of the J. Allen Pawling Award the year of her graduation. Following school, Lizz began employment with a local fabric designer at a contemporary quilt gallery, where she gained valuable insight regarding the role of business in the fibers world. 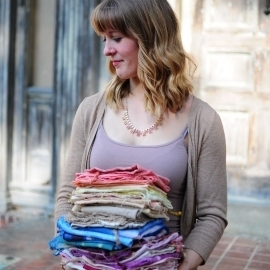 In 2016 Lizz launched her own company, The Wild Textile, which produces hand-woven wearables, wall hangings and table linens made of natural materials. 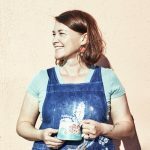 She is self-taught in the art of natural dyeing, which perfectly suits her two deepest passions: color and the outdoors. In 2017 she was featured in an award-winning video, Everyday Humans, which showcased this process. Lizz attributes her love of craft, textiles and color to her great-grandfather and grandmother, who were missionary doctors in Assam, India in the early 1900’s. Jewel-toned silk saris, complex woven tapestries and hand-carved miniature ivory statues, now over a century old, are just a few of her family heirlooms that inspire Lizz on a daily basis. Today Lizz can be found working on unique commissions and developing shop inventory at her home studio in Portland.